Jesús Zazo stood in the ancient plaza in a throng of other pink-clad members of the Colla Vella dels Xiquets club. He had everything riding on this grudge match in the Catalonia region’s signature competitive event: human-tower building. Mr. Zazo scrummed together with a couple of hundred other club members who formed the circular base of the tower, or castell. Three broad-backed men clambered atop this flesh-and-blood platform, wrapping arms in a huddle. Tier by tier, the tower grew. At seven levels, Mr. Zazo’s tiny daughter, Sarai, her face almost hidden by her helmet, began shimmying up. Halfway to the top, the 9-year-old seemed about to lose her footing. But she recovered, using the waist sashes worn by other club members like rungs on a ladder, and darted to the summit. Things went less well for rival club, Colla Joves Xiquets. When its youthful tower topper reached the peak, she gazed down and panicked. The structure began to buckle and then collapsed in a sprawling heap. 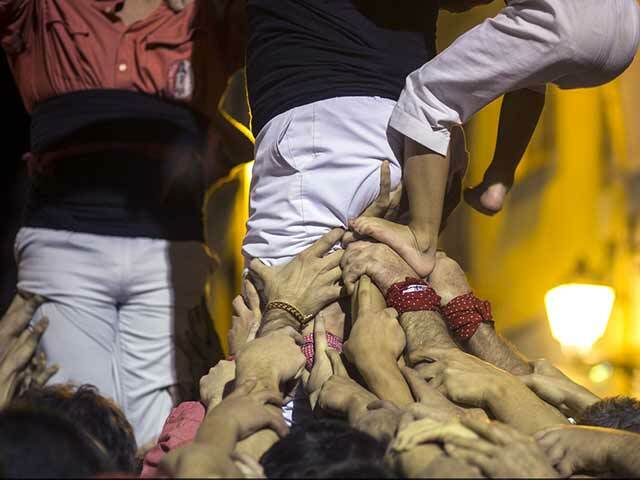 The vertigo-inducing tradition of building human towers, which has survived civil war, depression and dictatorship over two tumultuous centuries, is thriving as a haven of inclusiveness in a new era of upheaval in Catalonia.